Yes, ukulele is for everyone! No matter how old or young you are, and even if you’ve never played music before in your life, you can learn how to play ukulele… today! I’m about to show you how easy it is to play your first song on ukulele with step-by-step, easy-to-follow online ukulele lessons. For some of you, this will be the first time you make music in your entire life. Learning to play ukulele starts with the right foundation which is exactly what you do starting in this lesson right now. Note: Click any of the links above to skip to that section. For example, if you already know how to tune your ukulele you might skip to “How to play your first ukulele chord with ease”. With seven bite-sized video lessons, you have everything you need to learn how to play ukulele right now. And at the end of the lesson, I’ll show you how you can continue and learn three more songs on ukulele with me. The first and most important step to playing ukulele is to get a ukulele. It doesn’t matter if you borrow a friends, go to the music store, or buy a ukulele online. Don’t overthink it. Just get a ukulele! If you’re not sure what ukulele to buy, feel free to reference my handy ukulele buying guide where I provide tips and insight into the best ukuleles for beginners and how to choose a ukulele that is right for you. If you’ve never made music before, put aside your fears and doubts about playing. Watch the video where I introduce myself and offer specific encouragement to new ukulele players. My name is Brett McQueen and I’m a lifelong ukulele player and author of Ukulele Exercises For Dummies and the founder of this website and I’m excited to teach you to play ukulele. A lot of beginner ukulele players fail before they even pick up the instrument. 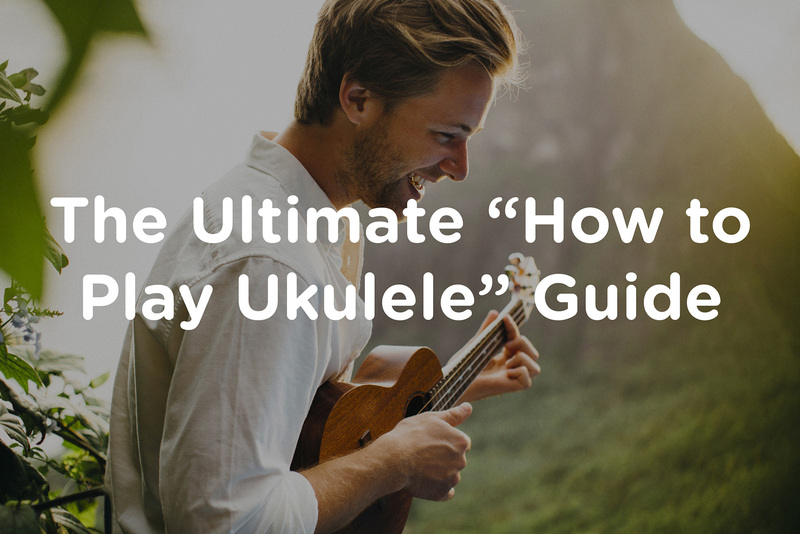 Whenever you tackle a new challenge like learning ukulele, it’s a big deal! It’s normal to face your own self doubt or fear. Don’t be hard on yourself and go into it with an open mind. Remember playing ukulele is about having fun! At first, the ukulele might feel like a holding a foreign alien object. How is this little instrument capable of making such a beautiful sound? In fact, a beautiful sound you create! Take a quick minute to familiarize yourself with your new instrument by reading about the parts of the ukulele and the different ukulele sizes. For what it’s worth, I’ve taught students in my online courses who are over the age of 90. If they can do it, you can do it too. Now that we’ve gotten introductions out of the way let’s get your ukulele tuned and ready to play. Tune your ukulele to standard reentrant tuning where the strings are tuned to g-C-E-A from top to bottom. In this video, discover how to tune your ukulele quickly and easily. This tuning method works for almost any ukulele including soprano, concert and tenor ukuleles. One of the most underestimated secrets to making your ukulele sound amazing is to tune it! You don’t want to skip this step. When it comes to stringed instruments like the ukulele, it’s important to check the tuning every 10 to 15 minutes of playing. Small errors in tuning can create quite a dreadful sound for you and your listeners. You always set yourself up for success with an in-tune ukulele. Fortunately, it’s easy to keep the ukulele in tune. For the fastest tuning, I always recommend using a chromatic tuner like the Snark SN-6 ukulele tuner I use in the video. If you have a baritone ukulele or have more questions about the notes you tune to or about alternate tunings, get the full ukulele tuning guide here. To hold the ukulele, cradle the body of the ukulele in your right arm, while the part of your forearm, closest to the elbow, applies a little pressure to the top of the ukulele, so it is held snug against your body. Then, support the neck of the ukulele in the crevice of your left hand where your thumb meets your index finger. Watch this video to learn how to hold the ukulele in the most comfortable playing position. You’ll soon see how holding the ukulele in a comfortable position allows you to change chords smoothly and to keep the strumming going steadily. Learn to play a C chord where you place the ring finger of your fretting hand on the 3rd fret of the bottom A-string and let the top three strings ring open. In this video, I show you how to play the C chord cleanly and clearly without buzzing. The first most important chord you must know on the ukulele is the C chord. To play a C chord, place the ring finger of your fretting hand on the 3rd fret of the bottom A-string. Let the top three strings ring open. Once your fingers are in position, go ahead and strum down across the strings. Don’t worry about the exact strumming technique for now. We look at that together in the next step. At this point, make sure every string rings out nice and clear. Keep in mind you might experience some soreness of the fingertips in the first weeks of playing ukulele. To remedy this, give yourself adequate breaks for your fingers to heal up between practice sessions. Eventually the tips of your fingers will build calluses making chords easier to fret. To play this essential and important strumming pattern, strum down strums while counting out loud to a count of four. If there is one strumming pattern to rule them all, it’s this one. Although simple, it’s a very effective pattern, especially whenever you’re learning a new song for the first time. In fact, this is a simple pattern I use to express and perform Leonard Cohen’s Hallelujah on ukulele. Watch the video and strum the C chord to a count of four with all down strums. Note: The above notation indicates to strum down to a count of four. The numbers “4/4” at the very left of the music staff indicate the pattern is played to a count of four. The letter “d” below the notation indicates to strum down. The letter “C” above the first beat indicates to strum a C chord. Repeat this strumming pattern as you count out loud. Keep the strumming and counting as consistent and even as possible. Believe it or not, you’re ready to play your first song on ukulele! Take the C chord and the simple down strumming pattern rhythm to play this simple, familiar song on the ukulele. Watch the video and take a listen to Are You Sleeping now. When it comes to learning a new song on the ukulele, I like to break things into small easy steps. Watch the following video to learn how to play this song. Click here to download the sheet music for Are You Sleeping. The first step to learn this song is to review the chords in the song. For this song, a quick glance at the sheet music and ukulele tab shows there is a C chord. Make sure you’ve practiced the C chord. The second step is to review the strumming pattern in the song. Again, make sure you’ve practiced this strumming pattern. The third and final step to learning a new song is to play through the song’s chord progression without singing. This means you follow along in the music for Are You Sleeping and play and count out loud as I show in the video. Once you can do this, then, it’s just a matter of humming or singing out the melody to this song! Now you might not win a Grammy with your performance of Are You Sleeping just yet but that’s okay! Just in this lesson you’re already building a foundation that puts you far ahead of most students. You’ve already tackled a lot! Give yourself a pat on the back for all your fantastic effort. You did it! You’re playing ukulele. Now, take your knowledge and learn three more easy ukulele songs. If you’ve made it this far, you’ve completed the first lesson in the four-lesson Learn to Play Ukulele Today video lesson course. Yes! I want the second lesson in the free Learn To Play Ukulele Today video lesson course.